SAN DIEGO, CA (ANS – November 12, 2016) – Verna Linzey, an extraordinary and multi-talented Christian woman, passed on to her eternal reward 11:05 a.m. at Naval Medical Center San Diego on Veterans Day (November 11, 2016) from heart failure, at the age of 97. And she leaves behind a tremendous legacy as the chief editor of the New Tyndale Version, translator for the Modern English Version, contributing editor for The Military Bible and The Presidents’ Bible, general editor of The Queen’s Bible, the host of television programs now being edited, author of theological books, writer of the hymn “O Blessed Jesus,” recording artist, and more. Her recording of “The Rose” was included on the soundtrack for “Iniquity” the movie in which she had a leading role. 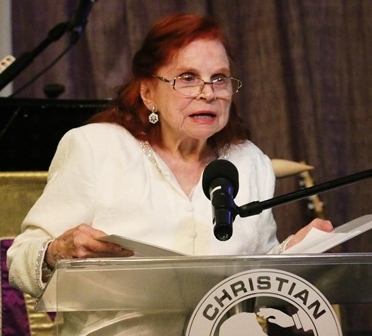 Verna was married to a Navy Chaplain, Stanford E. Linzey, Jr., and was also an honorary military chaplain with the Coalition of Spirit-Filled Churches, founding president of Military Bible Association, and served as one of its volunteer military chaplains. He told ANS that, at Westminster Seminary California, Verna received the National Bible Teacher of the Year Award in 2012, presented by Captain Ollie Mozon, senior chaplain of Camp Pendleton. The Assemblies of God presented Verna a Certificate of Appreciation for 50 years of active ministry as an Assembly of God minister in 2015. “My mother became a minister with the Assemblies of God in 1945 though she began ministering as an evangelist with her brother Franklin Hall and other reputable church leaders before that. She ministered to an estimated crowd of 20,000 people in Haiti in 2014, was the keynote speaker for a national pastors conference in Singapore in 2014, and ministered at the historic Bonnie Brae Street house and the Azusa Revival site in 2013,” he said. He went on to say that Verna attended Southwestern Bible School when P.C. Nelson was the president, later audited the entire Doctor of Ministry Program at Fuller Theological Seminary, and even later received a Doctor of Divinity degree at Kingsway Theological Seminary. “She has been certified as an Assemblies of God Church Planter. Accolades include ‘Leader of the Year’ award was presented at the 2011 Leadership Summit at the Heritage Foundation,” he added. Verna Linzey is listed in Who’s Who in the World, Who’s Who in America, Who’s Who Among American Women, and 2000 Outstanding Intellectuals of the 21st Century. She was the great grand-daughter of Jacob Mulford Hall, who served as a military chaplain in George Washington’s Army, wife of a Navy chaplain, mother of three military chaplains, grandmother of a Navy chaplain, and mother of ten children, Verna was proclaimed “Mother of the Fleet,” United States Navy. Besides her son, she leaves behind her daughters, which included Dr. Sharon (Linzey) Ackerman, who once took me on an extraordinary reporting trip to the Middle East. About James F. Linzey: Dr. Linzey is the chief editor of the Modern English Version, managing editor of the New Tyndale Version, general editor of The Military Bible, and general editor of The Presidents’ Bible. He is a highly sought after speaker for conferences, seminars, and churches. He can be contacted by e-mail at info@militarychaplaincy.com or by phone at: (760) 855-3905. Photo captions: 1) Vernal Linzey at a Battle of Midway event in San Diego. 2) Verna Linzey baptizes a new believer during her Crusade to Haiti in 2014. 3) Verna Linzey accompanied by her son, James, at the Premier of Iniquity, the Movie, in 2012. 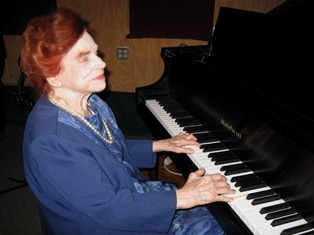 4) Verna playing the piano in a recording studio. 5) James F. Linzey. 6) Norma and Dan Wooding in Hollywood at a reporting event for ANS. About the writer: Dan Wooding, 75, is an award-winning winning author, broadcaster and journalist who was born in Nigeria of British missionary parents, and is now living in Southern California with his wife Norma, to whom he has been married for more than 53 years. They have two sons, Andrew and Peter, and six grandchildren who all live in the UK. Dan is the founder and international director of the ASSIST News Service (ANS). He is the author of some 45 books, and has been a full-time journalist since 1968. 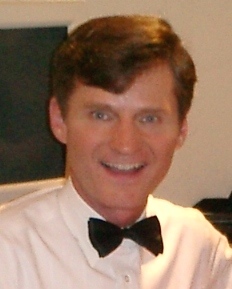 Dan has a weekly radio show and two TV shows in Southern California. While still living in London, Dan was a senior reporter for two of Great Britain’s largest circulation newspapers, and also did interviews for both BBC1 radio and LBC, the capital’s largest talk station. ** You may republish this or any of our ANS stories with attribution to the ASSIST News Service (www.assistnews.net). Please tell your friends that they can receive a complimentary subscription to ANS by going to the above website and signing up there.